Red flag No. 5. Watch out for people who aren’t at least reasonably amenable to standardised term sheets. Seedsummit, YC and many others have produced great templates that are pretty standard. Watch out for things like participating liquidity preferences (1x liquidity preference is probably ok, others would argue it’s pretty standard). Watch out for warrants, vesting clauses that are overly punitive, full-ratchet anti-dilution clauses and stuff like that. If you don’t understand these terms, you need to. Do yourself a favour and buy Venture Deals and appear smarter than your lawyer. Also, get a lawyer. Christchurch-based robot maker Invert Robotics raised more than $6 million from private investors as it expands into Europe and branches out into other sectors. The company first raised $740,000 through crowdfunding platform Equitise in May 2016 and has now raised $6.4m from private investors from Australia and New Zealand, including former Macquarie Group chief Allan Moss. Powerhouse Ventures is still the robot maker’s biggest shareholder, with 23 per cent of the company, according to Companies Office filings. The New Zealand Venture Investment Fund (NZVIF) is the second largest with 14.5 per cent followed by Guildford Investments with 5.3 per cent. The company produces mobile climbing robots with video feeds that can inspect industrial tanks without causing damage. Australasian dairy groups Fonterra Cooperative Group, Synlait Milk and Murray Goldburn and a number of global food and beverage brands use the robots, which have attracted interest from the food and beverage manufacturing industry in Europe and Asia such as FrieslandCampina and Heineken, the company said. Invert Robotics said it expects revenue to quadruple in the current financial year, with significant contributions from European operations. Revenue was less than $1m as at June 30, 2017, according to Powerhouse’s website. It is about to open premises in Germany and Denmark and has already opened in the Netherlands. Join us as our top ten students from the 2017/18 Summer Startup Programme pitch their ventures to a panel of judges from the local business community. This is the Centre for Entrepreneurship’s fifth summer startup programme, providing students with the opportunity to dedicate 10 weeks to their business or social venture. Students are surrounded by the structure of a full programme including external guest speakers, mentors, and industry experts. We have a fantastic cohort of more than 30 students; here is a link introducing the students and their ventures. This week, Steven and Kris from Parry Field Lawyers are going to tell you why the DEVIL really is in the DETAIL when you’re a start-up. Join us for a few startup horror stories, some “save your bacon” learnings and an intro to Parry Field’s Startup Legal Toolkit. We’ll also be handing the mic over to 2 brilliant young entrepreneurs from the UC Centre for Entrepreneurship. If you’re an investor or just keen to know how your world’s going to be changing, these pitches are a great place to start. See you there! Steven returned to NZ two years ago after 11 years working in Tokyo, London and Sydney. He now works often with start-ups on getting their structures right and has a particular interest in social enterprises having published the book “Social Enterprises in New Zealand: A Legal Handbook” last year. Kris leads the corporate, technology and startup advisory team, and regularly advises on business structuring, acquisitions, and much more for a number of not for profits, charities and Social Enterprises. He is also a Board Member of Code Club Aotearoa. Jess Scarsbrook and Jacyntha Michael are pitching Aspirations Café, a social venture providing a practical pathway to employment for young people with intellectual disabilities. Jack Wood will be pitching The Dandy Club, a men’s clothing venture dedicated to using only the most sustainable and innovative materials. There is a paradox in the notion of Kiwi ingenuity that lies in a disparity between our ability to invent and to implement. There appears to be no shortage of ideas in this country of ours, but there is a significant paucity of those ideas being brought to scale on a global level. We New Zealanders are an inventive lot. This is reflected in our ranking in a number of different indexes. For example, in The Global Creativity Index 2011, we rank sixth and in the 2012 Economist Intelligence Unit Creative Productivity Index, that analyses creativity and innovation in Asia, we again rank sixth. However, in The Global Innovation Index 2014 report, while New Zealand ranks eighth for local patents, we only come in at number 19 for filing overseas applications. Business analyst Alan Main suggests this failure matters: New Zealand has a 22% conversion rate of local to international patents, compared to Singapore, where the number is 81%, Finland, 58%, and Denmark’s and Ireland’s 42%. 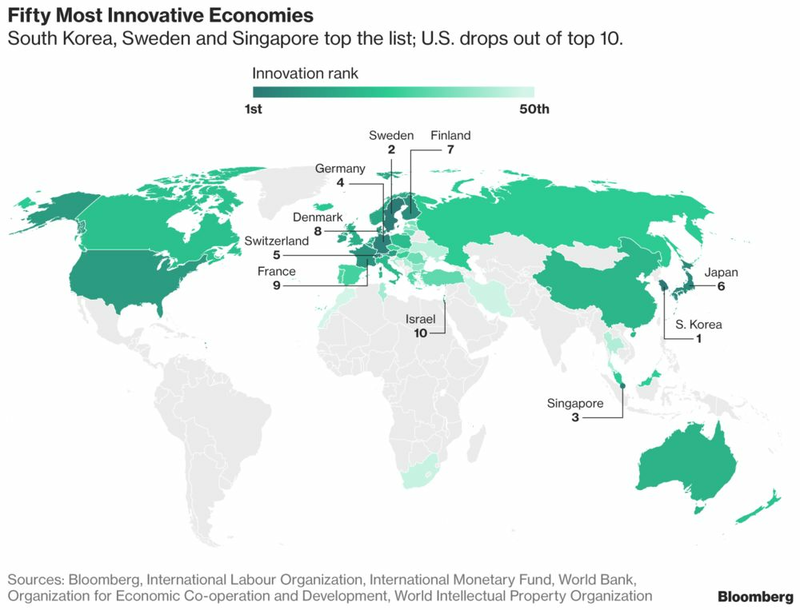 See full article including Bloomberg 2018 Innovation index here.